On the lookout for a high-end Android smartphone, but not sure in which direction your hard earn cash should fly? You probably know this by now, but the Samsung Galaxy S4 and the HTC One are the two major players in the high-end Android smartphone game at the moment. But are there any notable differences between them? And if so, when should you buy the HTC One and under what conditions is the Samsung Galaxy S4 preferable? 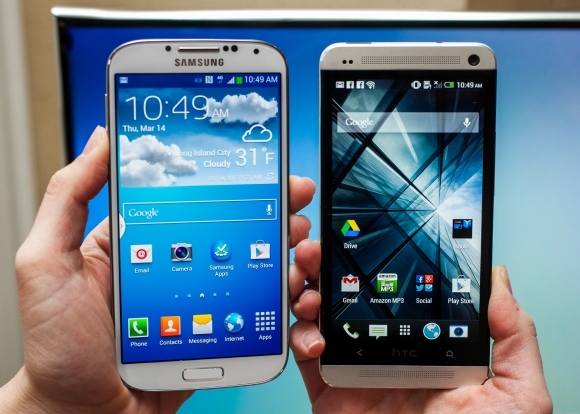 Join us as we thoroughly compare the HTC One and the Samsung Galaxy S4. As Motorola has not released a high-end smartphone for a little over a year, while LG has yet to release a successor to the LG Optimus G (the LG Optimus G Pro is more of a phablet than a smartphone by conventional standards), the HTC One and the Samsung Galaxy S4 seem to be the only choices left in the high-end segment of the Android smartphone market. But before we dive in their similarities and differences, it’s time for a short history lesson. The Samsung Galaxy S4 is the successor to the most popular Android smartphone of all time, namely the Samsung Galaxy S3. While the South Korean manufacturer did improve upon numerous aspects of the S3 with their “next big thing”, it is more than obvious that the Samsung Galaxy S4 is built on the same recipe as its predecessor. No matter how you look at it, the Galaxy S4 is a safe bet for Samsung. In the other corner, with the HTC One, the Taiwanese manufacturer did their best to design a unique smartphone, one that can stand out in the crowd, and hopefully slow down the steep decline of HTC stock prices. 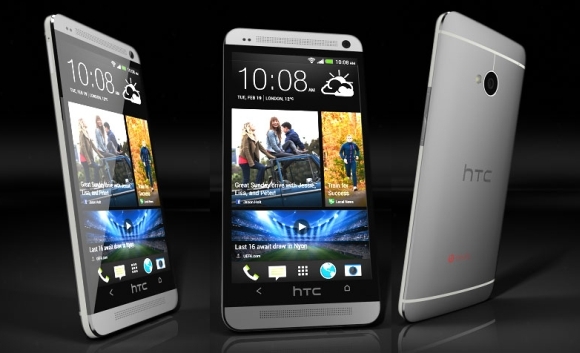 While the HTC One is not entirely revolutionary, you will find that it is innovative in numerous aspects. The HTC One measures 137.4 x 68.2 x 9.3 mm (5.41 x 2.69 x 0.37 in) and weighs in at 143 g. As the HTC One features a display that measures 4.7 inches across the diagonal, it can be said that the HTC One is not the most compact Android smartphone out there. Partially, the larger-than-expected footprint of the HTC One is due to HTC’s decision to equip the HTC One with a par of powerful stereo speakers, mounted above and below the display (when consuming media or playing games in landscape orientation, the speakers are to the sides). In the Samsung corner, the Galaxy S4 measures 136.6 x 69.8 x 7.9 mm (5.38 x 2.75 x 0.31 in) and weighs in at 130 g. It is really great to see that Samsung has focused on making the Galaxy S4 as compact as possible while increasing the display size to 5 inches across the diagonal. However, while the Samsung Galaxy S4 is more compact (when compared against the size of the display), the HTC One is the smartphone with better build quality. The aluminum chassis gives the HTC One a very premium feel, while not the same can be said about the plastic material body of the Galaxy S4. Take Off: The Samsung Galaxy S4 is the more compact of the two, but the HTC One is probably the Android smartphone with the best build quality out there (and it also features a pair of powerful speakers). The HTC One uses a 4.7 inch SuperLCD 3 display that runs at a 1080p resolution (1920 by 1080 pixels) at a 469 PPI (Pixel Per Inch) ratio. This is the crispest display available on any smartphone, and one that reproduces natural colors and unmatched brightness levels. In the other corner, the Samsung Galaxy S4 uses a 5 inch Super AMOLED display that also works at a 1080 resolution, but since the display surface is larger than that of the HTC One, the PPI ratio rests at 441. The Samsung Galaxy S4 uses a variation of the PenTile Subpixel arrangement (meaning that the overall number of subpixels is by a third lower when compared against a display with a regular RGB subpixel layout), but at such high densities, you cannot tell the difference with the naked eye. The display on the Galaxy S4 makes use of deep blacks and vivid colors, but still has some problems with natural/accurate color reproduction. Take Off: While the over-saturated colors of the display on the Galaxy S4 can be somewhat solved by decreasing saturation levels in the settings menu, the HTC One is still the Android smartphone with more accurate color reproduction, better brightness levels as well as a less reflective display. On the other hand, the SAMOLED display on the Galaxy S4 wins when it comes to black levels, viewing angles and sheer size. The HTC One comes with a Qualcomm Snapdragon S600 SoC, one that consists out of an Adreno 320 GPU, 2 GB of RAM and a quad-core 1.7 GHz Krait 300 CPU. In short it is a beast, although both versions of the Samsung Galaxy S4 are a bit faster. The US version of the Samsung Galaxy S4 is based on a slightly modified version of the Snapdragon S600: the GPU and the RAM remain the same as inside the HTC One, but the frequency of the CPU has been bumped to 1.9 GHz per core. The international version of the Galaxy S4 is based on a Exynos 5 Octa 5410 SoC, one that translates into 2 GB of RAM, a PowerVR SGX 544MP3 GPU, and a quad-core 1.6 GHz Cortex-A15 CPU that’s paired with quad-core 1.2 GHz Cortex-A7 (the faster, more power hungry A15 CPU steps in only when extra processing power is required). Overall, the US version of the Galaxy S4 is only slightly faster than the HTC One, while the international version of the Galaxy S4 is noticeably faster than any other smartphone available in the Android smartphone market. The HTC One comes with either 32 GB or 64 GB of internal storage, but cannot work with microSD card slots. In the other corner, the Samsung Galaxy S4 comes in 16 GB / 32 GB / 64 GB variants, and can also work with microSD card slots of up to 64 GB in size. The Samsung Galaxy S4 comes with a 2MP front camera and a 13MP primary camera, but the HTC One comes with a 2.1MP primary camera and a 4MP “Ultrapixel” camera. 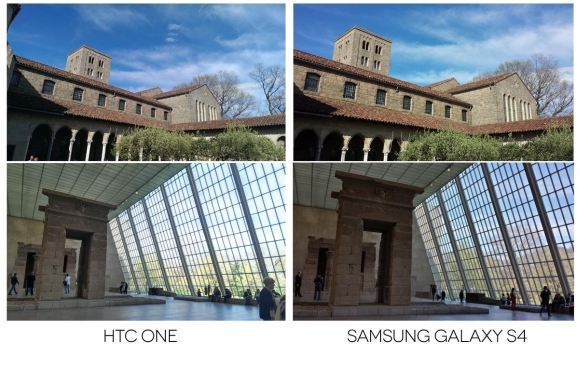 HTC One’s Ultrapixel camera was designed to let more light in the sensor, and thus fares significantly better in low-light conditions (such as night or indoor photos). Unfortunately, though, the low resolution of the photos is much more obvious when taking pictures during daytime, a context where the 13MP camera on the Galaxy S4 performs much better. The HTC One comes with a 2300 mAh non-removable battery, while the Samsung Galaxy S4 comes with a 2600 mAh user-removable battery, meaning that the Galaxy S4 is better equipped in this sub-segment as well. Take Off: The Samsung Galaxy S4 is faster (in both versions), can work with microSD card slots, has a larger, user-removable battery and a camera that takes better photos during daytime. The only advantage that the HTC One has over the Galaxy S4 in the hardware segment is the fact that the “Ultrapixel” camera can take better photos in low-light conditions. Although the HTC One was launched with Android 4.1, it has been recently updated to Android 4.2 Jelly Bean, the same Android version used by the Samsung Galaxy S4. As it is always the case with Android smartphones, the differences lie in the custom skins that HTC and Samsung have overlaid on top of the Android OS, although it should be mentioned that the biggest part of any Android experience is made up by the Android apps. HTC One uses HTC Sense 5, a clean and minimalistic custom UI, one that comes with a bunch of interesting features such as Blinkfeed (basically Flipboard on your home screen), HTC Zoe, Sense TV, HTC Sync, HTC Zoe and numerous others small improvements. In the Samsung corner, the Samsung Galaxy S4 comes with a more bloated design, but with more useful features as well. Samsung calls them “Smart Functions”, an inspired name as some of the features, such as Air View, Smart Stay, Smart Scroll, Dual Camera and S-Bean can prove to be not only useful, but unique in the Android ecosystem as well. 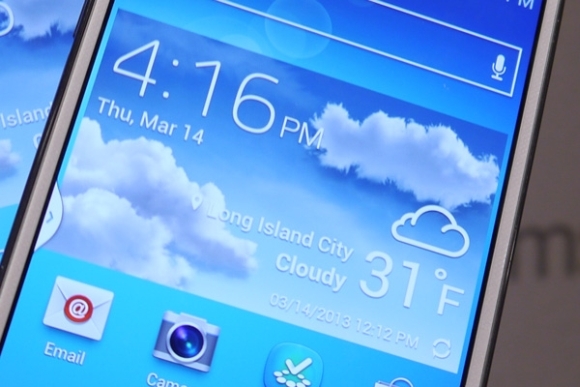 Take Off: HTC Sense 5 has a much cleaner and uncluttered design, but really provides few useful extra functions, while the Samsung TouchWiz version on the Galaxy S4 is a bit more clouted, but comes with an entire array of useful software features. If you want a powerful Android smartphone with a compact and very sharp display, dual-speakers, an amazing aluminum chassis and a custom UI that will do its best to stay out of your way, go for the HTC One. On the other hand, if you cannot live without owning the fastest Android smartphone currently available, you cannot be separated from your microSD card, will not settle without a 5 inch display, take the Samsung Galaxy S4 for a spin, you might be impressed. What are your opinions on this matter? Have we left any details out of this comparison? Let us know what you think in the comment section below!